Continuing with the series on how to create a podcast, we'll look at the hardware and software you need to create and share your podcast. Or- the technical side of podcasting. Fortunately it wasn’t nearly as technical or difficult as I originally thought it would be. I think you'll be surprised at just how easy (and inexpensive) it is to get started. To record an audio podcast, you'll need a microphone and a computer. 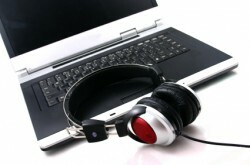 You will also need audio recording & editing software. I use the Audacity software which is free, and both Mac and PC compatible. It's super easy to use - in fact, it's simplicity is it's best feature in my opinion. No complex bells & whistles. A high quality microphone is ideal for podcasting. I have been using the Plantronics Wireless USB Headset for interviews, webinars, guest appearances on podcasts, audio/video creation, etc - and I love it. For my podcast, I decided to go to a higher quality mic and chose the Blue Yeti USB Microphone. You can listen to a sound quality comparison of the two at that link. You'll simply plug your mic into your computer, open Audacity, and start recording. You can also edit your audio in audacity, and easily add intro music or an intro clip. For intro music do a search on Google for "royalty free audio" or "royalty free podcast music" as a start. I decided to have a custom intro (a "jingle") created for my own podcast, for stronger personal branding. In order to share your podcast with others, you have to upload it to the web. The most popular and least expensive option is Amazon S3. There is a Firefox Plugin that makes uploading your podcast episodes (media files) to S3 very easy. I am starting with Amazon S3 myself, but ultimately plan to invest in a higher quality podcast host that allows easy insertion and removal of advertising across a series or set of podcasts. Ideal if you plan to monetize your podcast with sponsors or advertising. I'll share details on that host & the features when I have it myself. Once you have created your media file and uploaded it to the web, you'll want to share it with the world. The first step is creating an RSS Feed for your podcast. The PodPress plugin for WordPress is a good solution, as it integrates your podcast with a WordPress blog - and generates an iTunes friendly RSS feed at the same time. You can now submit your podcast to iTunes so that it can be found by searchers. You'll also be able to properly optimize the blog posts for each episode, bringing in free search engine traffic. One other thing you'll need is Album Art. This is an image that represents your podcast in iTunes, and can also be used across your social media profiles. You want to create this in super high quality, 1280x720 so that it doesn't look grainy on Apple TV and similar. You can easily outsource this task on freelance job boards if you're not the creative type. Now that you've generated an RSS Feed and WordPress blog for your podcast, be sure to submit it to both podcast and blog directories! Once you have everything set up, continue recording & uploading on a regular schedule. Creating a publishing schedule will help you line up topics and stay on track - consistency is good. You can tweet when you have a new episode available, and also involve your followers by letting them submit questions or suggest topics they'd love to hear. Your blog and social media profiles can do a lot to grow your listener base and make your podcast successful! Also, I have been using a CAD U37 usb mic for all my recordings for videos, audios, webinars, etc. and I love the quality of it. I paid about $75 for it at a local Guitar Center and then I purchased the 2 year replacement insurance for an extra $20 since I have 3 small kids. Anybody with kids should really consider getting the insurance just in case. A high quality microphone as been one of the best investments I have made in my business. These are excellent resources you are providing. I bought the insurance when I purchased the mic from Guitar Center. But you are right, you can add anything you want covered to your homeowners policy. Just call up your insurance agent that handles your homeowners policy and tell them what you want to do. They should be able to accommodate you with no problem. I LOVE your jingle! Pretty cool! I have tons of audio interviews that I need to turn into podcasts, but I'm just not ready for another project, still on the hunt for a compatible VA to help me. You have the hard work done already if you have audio files recorded. It's all downhill from there. I really look forward to getting started when I return from my vacation next week! Hi Lynn, Great blog series btw! I have a Blue SnowBall Mic and was considering buying either the "Blue Bird" or the "Baby Bottle" by Blue Mics, but that Yeti sounds really good and is about half the price. You may have saved me a small bundle! Blue's Snowball Mic is a great one - I'm curious why you are looking at a different one? Is it a certain feature you're after? Yes Lynn, there is a special reason that I'm looking at the higher-end mics such as the "Blue Bird" or the "Baby Bottle" by Blue Mics, if even only for my video's. Several years ago (back when I had money to burn) I built my own recording studio in my house... I have had extensive experience in digital recording... I've even bid on and won a "Live Quior" recording event of which I was able to obtain help and resources from "The Sound Kitchen" (Google them. They're awesome! - Arguably the largest studio in Nashville) having $150,000 worth of equipment "on site" in my possession! Yes, talk about high-pressure..YIKES! But it was fun, and my customer was slobbering with amazement when we (I had a partner btw) drove him to "The Sound Kitchen" to do the final Mixing and Mastering... The point being.. I know how to make digital audio (for my videos), far more professional sounding than almost anyone else is doing. I think Ed Dale knows what I'm talking about, Ed has used the "Line 6 POD Studio UX2" mic-pre before, ask him about it, I'm sure he'll say .. "Oh Yes! That Line 6 Mic-pre is really cool for only $200!..." 😉 Anyway..
A High Quality "Phantom Powered" mic, an outboard "Mic Preamp" (I already have a good preamp) and preferably an outboard "Compressor-Limiter" is what I'm considering buying. MAN! - That Yeti sounds pretty good for just $150 and it's simple "Plug and Play!" IMHO for beginner podcasters who don't want to waste money ... Get The Yeti! (or the snowball - either one). ok, I'll shut-up shutting up now. Can you use Audacity to record conversations on Skype? If not did Paul have any recommendation for this? I'm on PC not Mac. Podpress will work, but not my recommendation. The original developer has more or less "quit." This left thousands of podcasters stranded a while a go with a plugin that didn't work (it also had features such as stats that broke many a website). The last update of podpress came from the people who create wordpress as they someone HAD to do SOMETHING. It was a mess. I recommend powerpress from the blubrry network (google Powerpress). All the features of Podpress, and a dedicated person developing it and making sure its compatible. Also, be careful with Amazon S3. Yes it's Oprah proof, but that "cheap" can get expensive. Before I switched my last hosting bill was $44 (and rising each month). I have a few tools to help anyone in that boat and wants to switch. I too use Libsyn, and have never had an issue. The upside of Amazon is it has Amazon (who is not going anywhere) behind it. Libsyn is the one I'm looking into - and thank you for the note on podpress. I also have powerpress (bluebrry) installed and it is what I used to give the example jingle in my post above. Will definitely check into that - hoping it has all the same features, and also supports video podcasts. Thank you! Check out powergrammo.com Its a software that makes recording skype easy. I also recommend using an external recorder (straight form the headphones out, and then plugin your headphones into the recorder to hear). This takes the stress of running skype, and recording skype off of the computer and puts it on to the external recorder. I like the Zoom H4, and they are coming out with a Zoom H1 in a few weeks ($99). The best (and maybe only affordable) option for recording Skype video conversations is http://www.ecamm.com/mac/callrecorder/ - Call Recorder - Dead cheap at about $20 and completely reliable. Note that it comes with some converters for the files since it saves them all as .mov and you'll need to convert many of them to mp3 for example. You can follow him on Twitter at @RiseToTheTop - Great guy. Great tips on here. Fantastic to see so many people interested in podcasting. Great series you have running here Lynn! My wife and I have been doing out podcast for a couple of months now and I definitely recommend PowerPress over PodPress. Its VERY easy to use! I will also recommend hosting your files on Mevio. We've had great success with them and its super simple. The also handle the iTunes syndication automatically. One other recommendation... have the podcast transcribed. I have a VA that does it for me, costs about $5 per episode ( a little more if I get long winded ). When she's done she posts it to the site for me in a category that doesn't post to the front page but does get indexed by Google. VERY good for traffic! Last, and certainly not least, I'm also a big fan of @therisetothetop! Awesome show, definitely worth the time to watch. Thanks again Lynn, keep 'em comin! Thanks for all the great replies about recording Skype. Lynn - what does Paul Colligan use to record Internet Marketing this Week? (Don't you record that on Skype?). Does he know of a PC equivalent of that? Hi Lynn - Thanks for the post. I'm a musician and I have recently started creating podcasts that discuss music its history and how and when it should be played. Your article and comments have given me some great insight on how to move forward. PodPress looks promising what do you think? To record all kinds of conversations I use TalkAide for Skype. I'm right at the start of podcasting and really appreciate your posts. I know they're a bit 'old' now, but I'm guessing the principle is still the same. And I can track down the new versions of the stuff you're referred to. Glad I found your blog......seems great...thanks!